Martin Chalfie is promoting preprint archives for biological research papers that will make new results and findings accessible to a significantly bigger audience much faster. 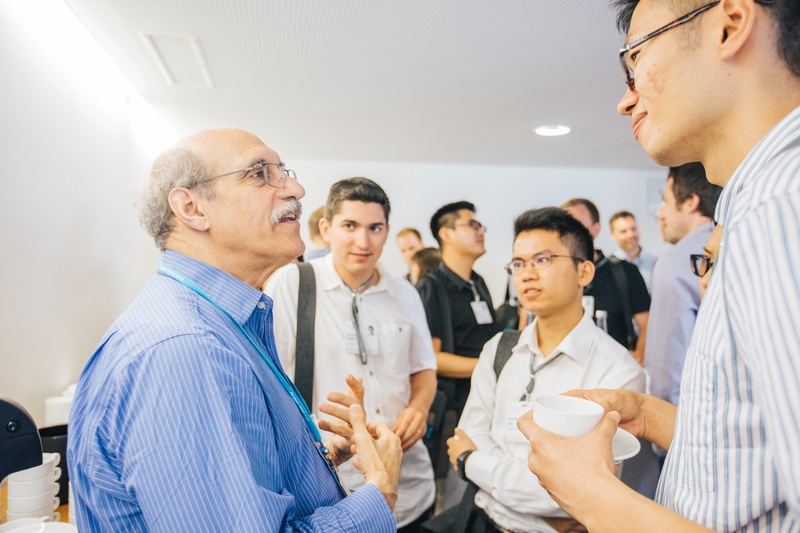 Important questions that kept cropping up during the 67th Lindau Nobel Laureate Meeting include what the future of research can and will look like and how the status quo can be improved. Beside the oft-mentioned political events and their influence on science, another major issue concerns an intrinsic problem: the publication machinery and the importance of the impact factor. Shortly before the meeting, a number of Nobel Laureates publicly criticised the current journal-ranking method. During the meeting, Martin Chalfie also expressed his view that publications should be assessed more on the basis of their factual quality and less on which journal they appear in. I asked him what he had in mind as an alternative and what steps, if any, he has taken. His solution is: ASAPbio.org – Accelerating Science and Publication in Biology. ASAPbio is an advocacy group founded by Ron Vale – an initiative instigated by scientists for scientists it aims to make new discoveries within the life science available to a broad audience much faster than previously possible. Chalfie helped launched the initiative in early 2016 together with Harold Varmus, Daniel Colón-Ramos and Jessica Polka, now the director of ASAPbio. “We wanted to develop a preprint archive for biological research. There has been something similar in physics for at least a quarter of a century.” As soon as researchers are ready to share their work and findings with the world, Chalfie continues, they can upload their articles to a preprint archive, where it can then be read and commented on by other scientists as well as by the general public. The largest preprint server for life science-related articles is bioRxiv. ASAPbio promotes the use of open access centralised and comprehensive repositories for all life sciences. “This changes the overall dynamics of the publication process,” Chalfie says. The conventional publication pathway looks quite different: A scientific paper is submitted to a suitable journal. In an initial step, one or more editors then decide whether the paper is appropriate material for the journal in question. If the editors give the go-ahead, the paper is passed on to several experts in the field. They then form a picture of the work and can, if they deem it necessary, reject the paper as deficient or request further experiments. In such cases, the authors have several months to make the requested changes before a final decision is made, which can still be negative even after suggested changes have been made. All in all, the decision-making process can take from several months to a year, and if the paper is ultimately rejected, the authors have to submit it afresh to another journal. As a result, not only the authors lose valuable time but also the research community and the public at large, who have no access to the new findings during the decision-making process. “By contrast, preprint archives make new discoveries and research advances immediately available to everyone – whether scientists or students – and they do so free of charge,” Chalfie says, summarising the advantages. Moreover, each paper is automatically assigned a definite submission date which the authors can refer to should a similar work be published soon afterwards. However, Chalfie, points out, “it’s not about publishing raw data at an early stage.” Instead, a manuscript should be uploaded to an archive platform at the same time as it is submitted to a journal. It is then revised in stages in response to feedback from the journal and comments submitted via the platform. “During one of the first organisational meetings, we talked about how the established journals would be likely to react to such an initiative and these platforms. Fortunately, the major journals such as Science, Nature, the journals of professional societies and many others all support the idea of preprint archives and the general repository,” Chalfie explains. The journals have no problem with authors submitting their papers to them and uploading them to a platform simultaneously. Many journals even allow “joint submissions”, meaning that they ask authors whether they want to make their papers available on an archive server at the same time. Another sign that this new pre-release system will catch on in the long term is the acceptance of such prearchived work as a criterion for grants, the allocation of project funds and similar selection procedures. “The Howard Hughes Medical Institute, the NIH, the Wellcome Trust and many universities now consider papers in the preprint archive in their evaluation of applicants,” as Chalfie relates proudly. Although the new preprint archives as well as the general repository for biological research are still in their infancy compared to the fields of physics, and they have yet to be discovered by many scientists, they have already been acknowledged and accepted by major research institutes and renowned journals. Therefore, advocacy groups such as ASAPBio offer an excellent opportunity to take the cumbersome publication process in the life sciences to a new direction and focus once again on the actual quality of research work instead of mere impact factors.